Hi everyone. 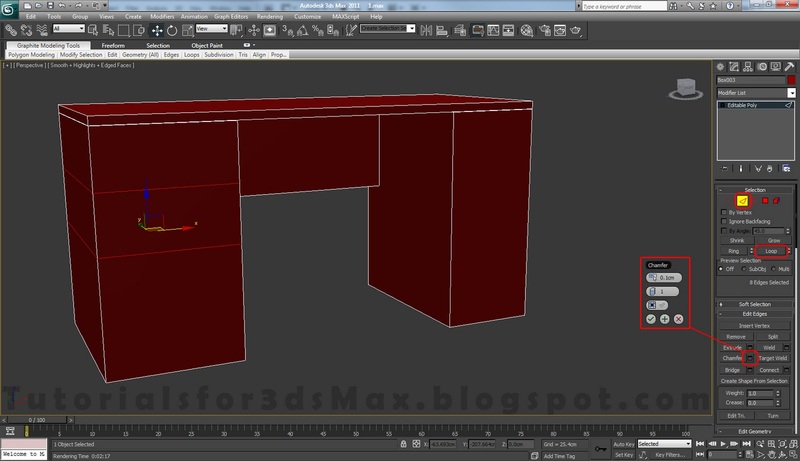 In this 3D modeling tutorial i will show you how to create a Desk using 3d Studio Max 2011. 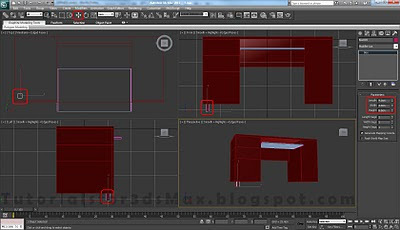 I will cover only the 3d modeling part. 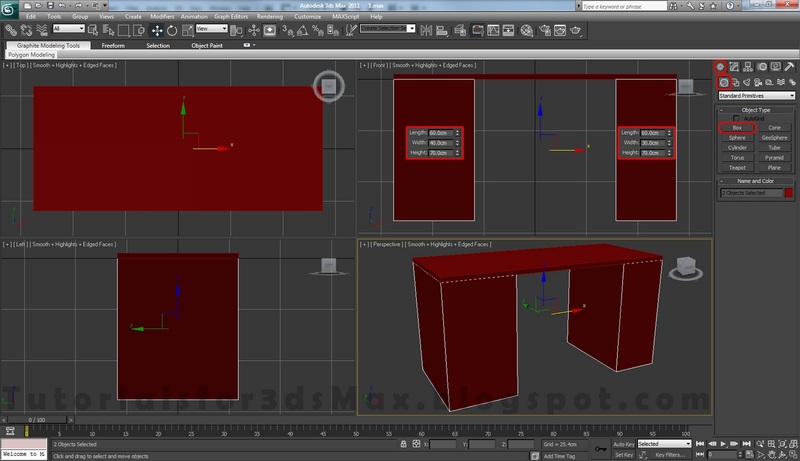 The textured model you see on the left it's only for preview. We will use 3d modeling tools such as: Connect, Chamfer, Inset, Extrude, Bevel, Attach, etc to achieve our result. 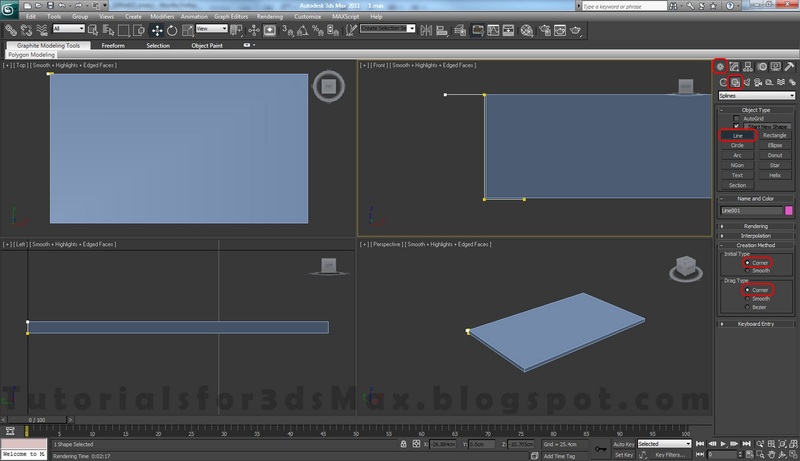 Also 3d modeling modifiers like Extrude and Shell will be used. Feel free to comment if yoou get stuck. Let's move on. Step 1: To start our 3d modeling tutorial first Open or Reset Max. From Command Panel, Create, Geometry create a Box in Top View with Length 60cm, Width 140cm and Height 2.5cm. 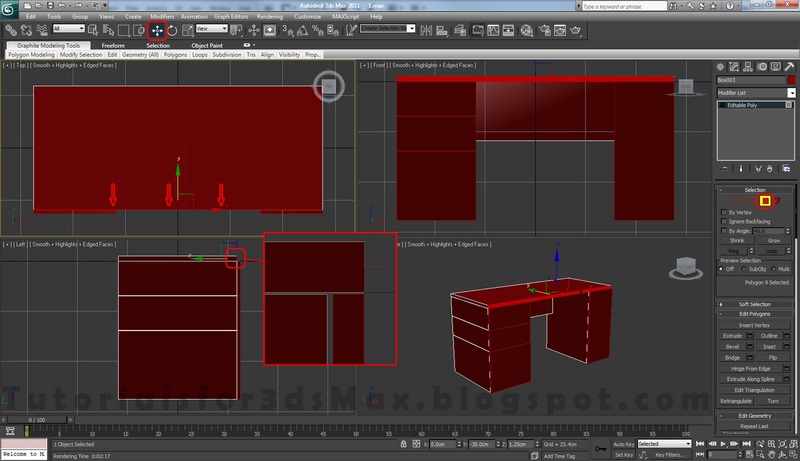 Step 2: Create two more boxes in the Top view. The one on the left with Length 60cm, Width 40cm and Height 70cm. 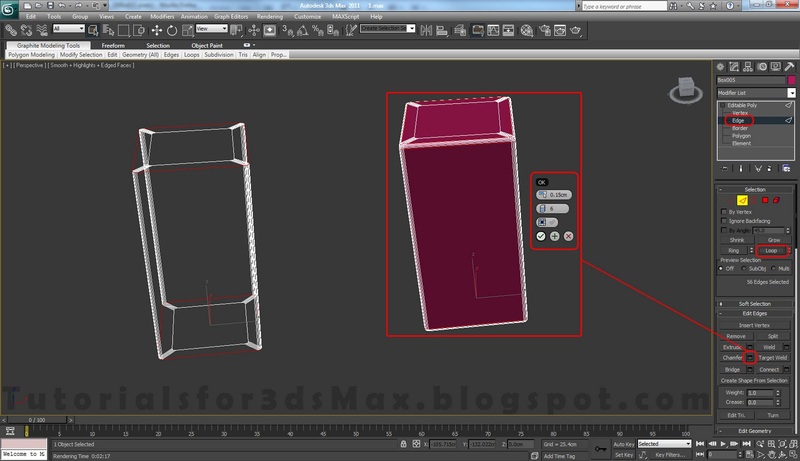 For the box on the right use this settings: Length 60cm, Width 30cm and Height 70cm. Now using Select and Move tool move the boxes around to align the to the first created box like i've did below. Use F3 to turn on/off wire frame view to see exactly what you are doing. Step 3: Select any one of the 3 boxes. 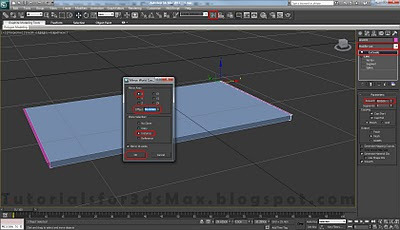 Right click on it and select Convert to>Convert to Editable Poly. In Command Panel go to Modify tab, click the box next to Attach, i new window will pop-up, hold down CTRL and select the other 2 boxes. Click Attach to attach all 3 boxes together. 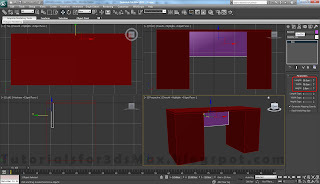 Step 4: In Front view create a new box. Length 30cm, Width 70cm and Height 2.5.cm. Using the Select and Move tool align it to the rest of the boxes like i've did below. Attach this box to like we did in previous step. Step 5: In Modify tab go to Edge selection mode(shortcut key "2"), select the edges i've selected below. Select on and click Ring. Now Connect them. 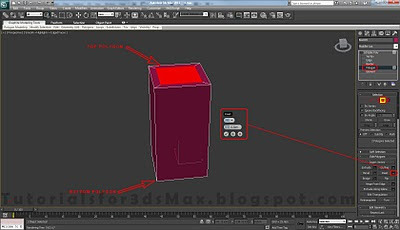 Click on the box next to connect, leave everything as default(1 segments, 0 pinch and slide) and click OK. 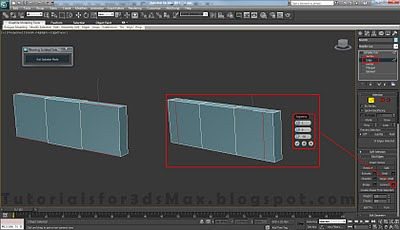 Step 6: Again, select the edges i've selected below and connect them with default settings. 1 Segment, 0 Pinch and Slide. Step 7: Connecting the edges together in Step 5 and 6 resulted some new edges. Select two edges(one from every line) and click on Loop to make a loop selection. 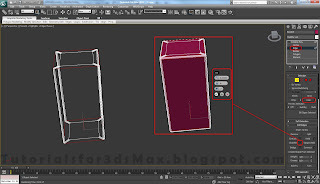 New click on Chamfer box and apply a chamfer with an amount of 0.1cm and 1 Segment. Press OK. Step 8: Go to Polygon selection mode(shortcut key "4") and select 3 polygons like you see in the next image(don't select the polygons between them). 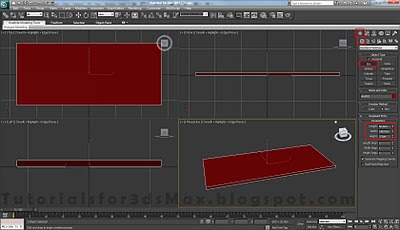 Hold down SHIFT and using Select and Move tool move them just a little bit(0.1cm) in Y axis direction. 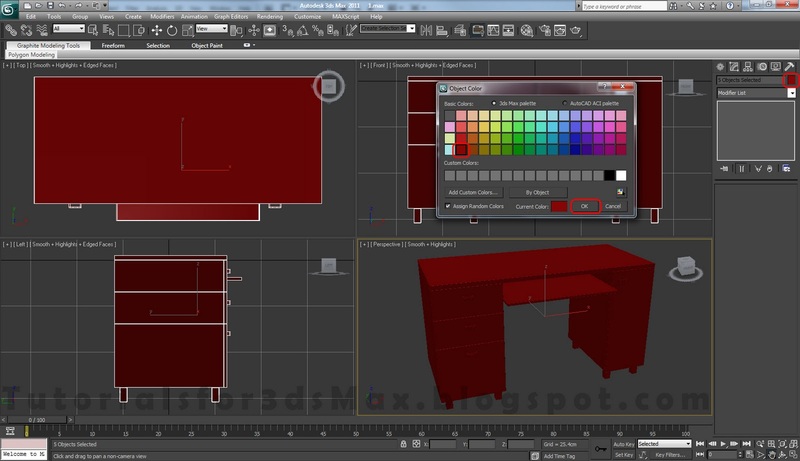 A pop-up window will appear, select Clone to Object and name them Drawers. Click OK. 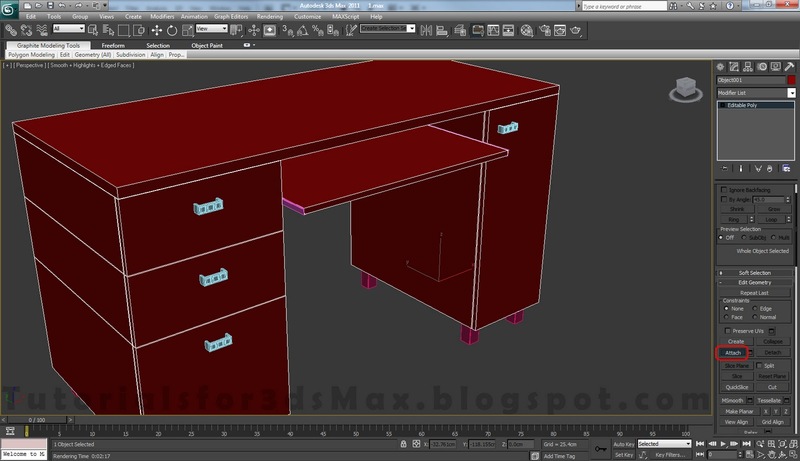 Step 9: Press H on you keyboard to Select from Scene, select the Drawers and click OK. From the Modifier list apply a Shell modifier with an Outer Amount of 1.5cm. 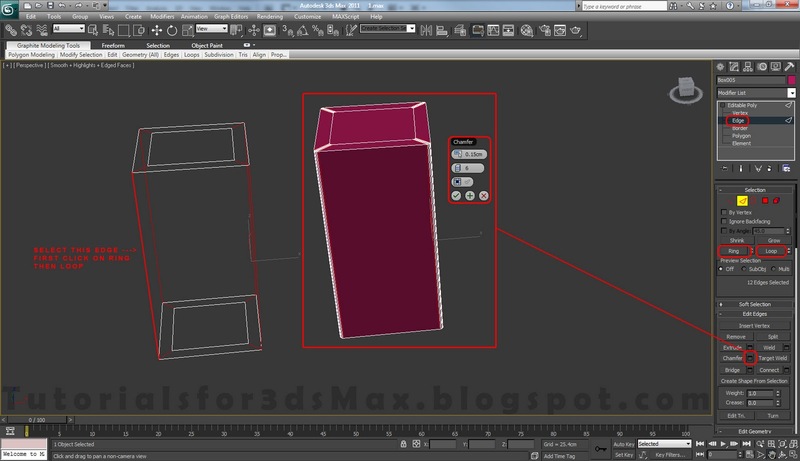 Convert the object to Editable Poly. 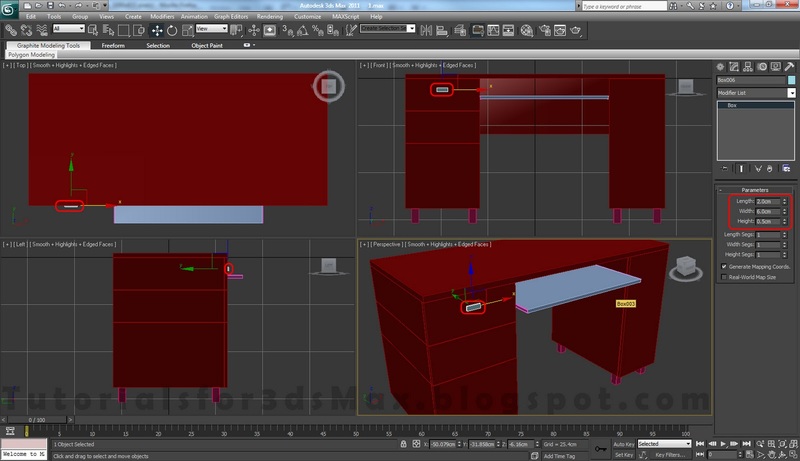 Step 10: Now do the exact same thing for the drawer in the right. 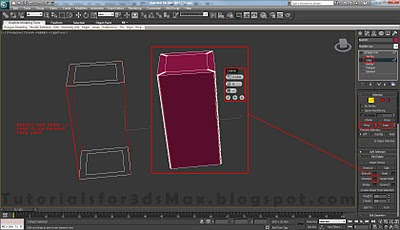 First select the Polygon, holding down shift move it in front a little bit to create a clone and detach it, select it and apply a Shell modifier with and Outer Amount of 1.5cm. 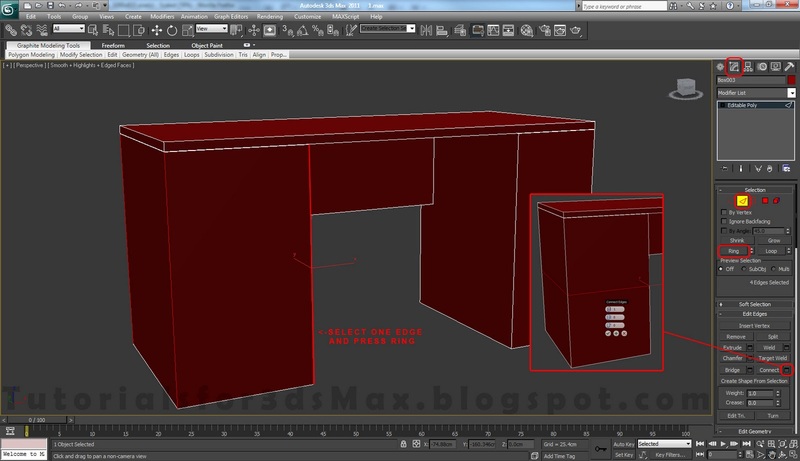 Convert it to Editable Poly. 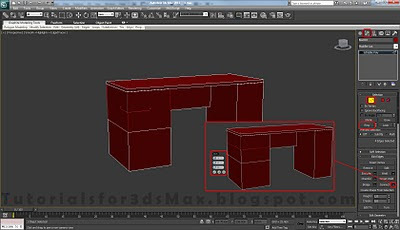 Step 11: Select the desk and go to Polygon selection mode(shortcut key "4"). 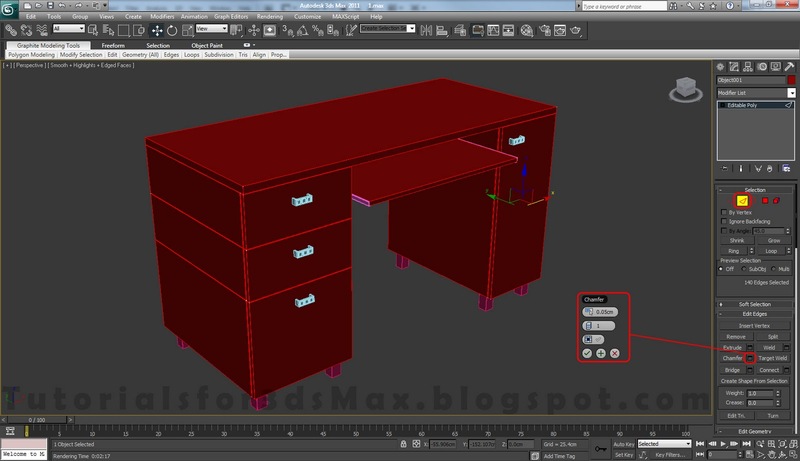 Select the margin Polygon and move it on to of the drawers like i've did below. 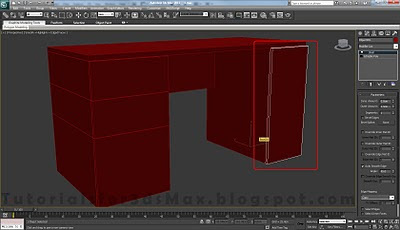 Step 12: For the inside sliding draw create a new box in Front view with Length of 1.5cm, Width 69cm and Height 40cm. 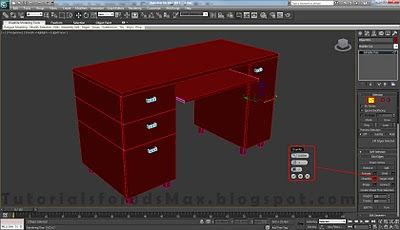 Using Select and Move tool move it to fit the inside of the desk. Step 13: With the new created box selected, right click on the screen and select Hide Unselected to hide everything else except sliding drawer box. From Create, Shapes select Line. 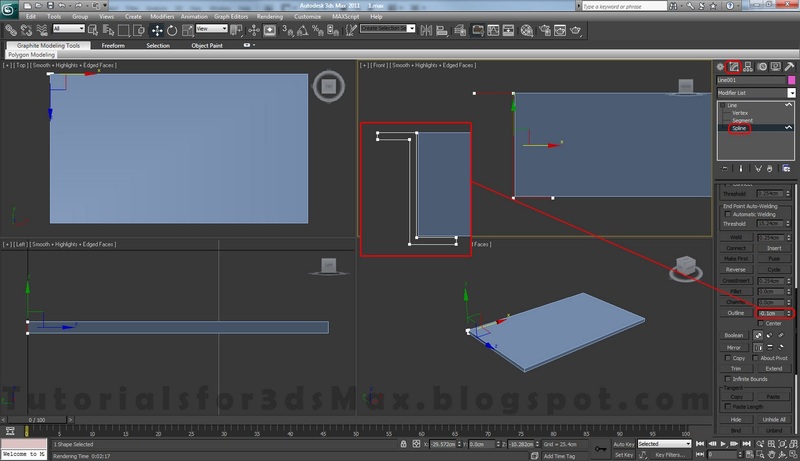 Set the Initial and Drag type to corner and create a new Line like in the below image. Step 14: Go to Modify tab and select Spline from selection rollout menu(shortcut key "3"). 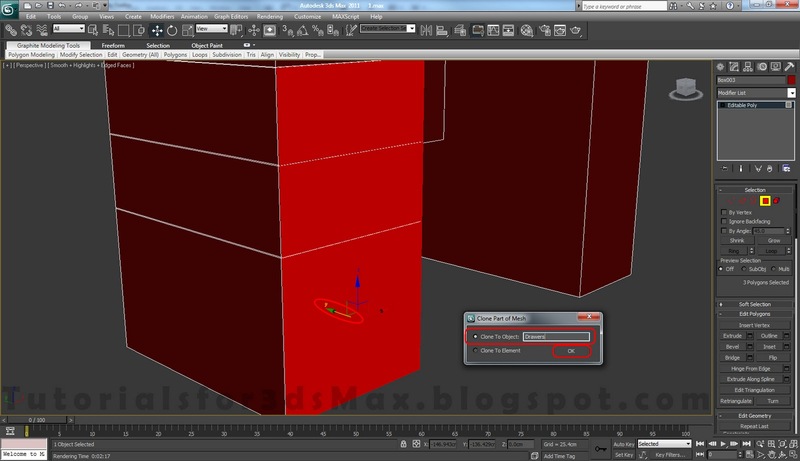 Select the spline by clicking on it or by pressing CTRL+A(select all). 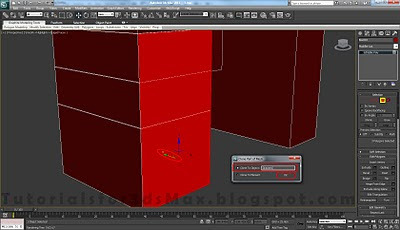 In the box next to Outline enter -0.1cm and press enter to create outline or simply click on outline move the cursor on to of the spline, click and drag until you achieve your desired result. Step 15: From the modifier list apply an Extrude modifier to out Spline with an amount of 40cm. 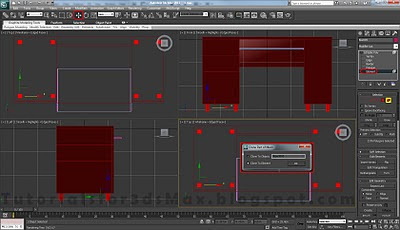 Now using the Mirror tool, mirror our object in X axis, Offset amount 69.164cm and Clone Selection Instance(every change you make to your object will be made to your mirrored object). Click OK. Step 16: Right click on the screen and select Unhide All. 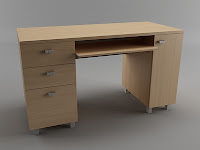 You can see that our rail is overlapping with the desk. Select the rail go to Vertex selection mode(shortcut key "1") and move the to vertices that are overlapping to the right. 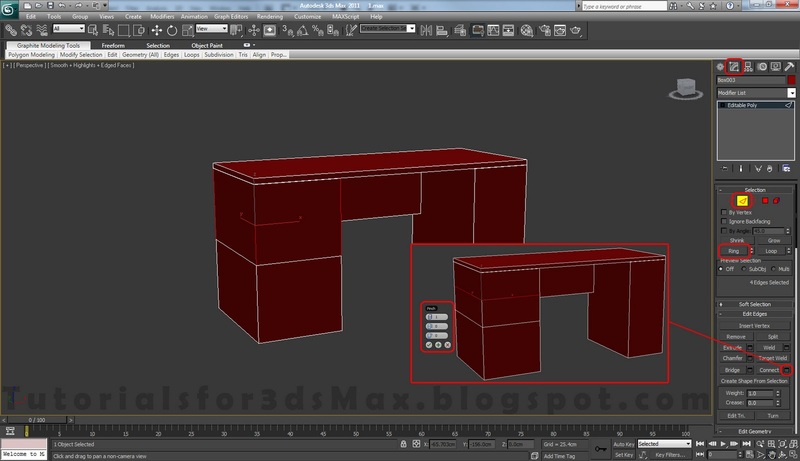 Step 17: Continuing with this 3d modeling tutorial we will create the desk legs. In Top view press F3 to turn on Wire view. 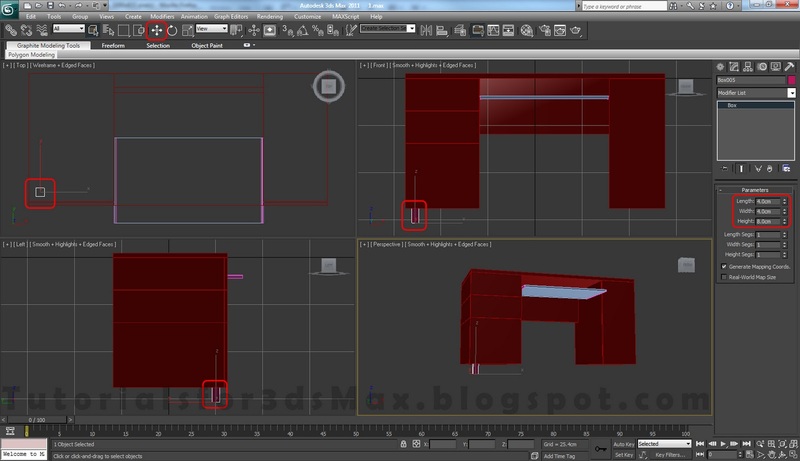 Create a new box with Length and Width 4cm and the Height of 8cm. 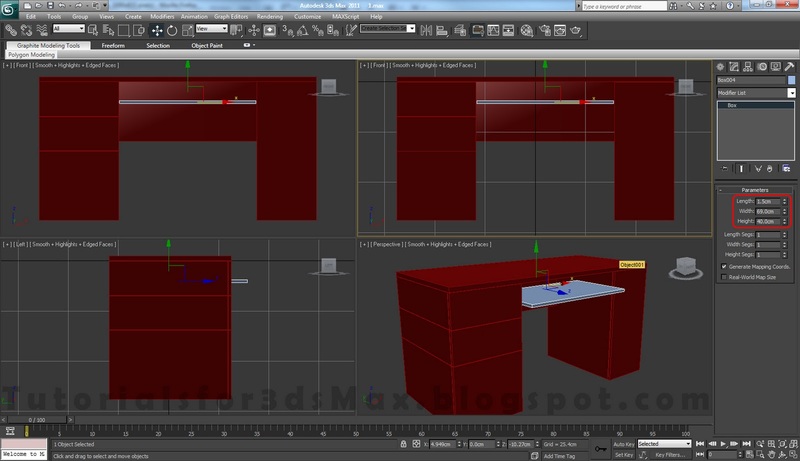 Convert it to Editable Poly. Step 18: Hide Unselected. 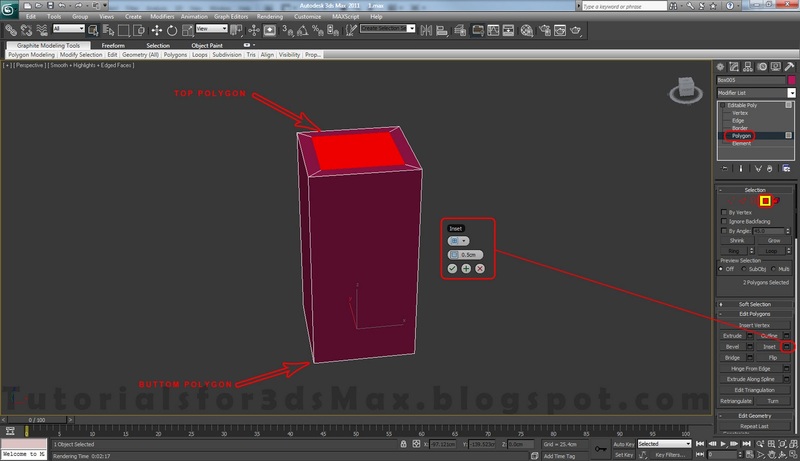 Go in Polygon selection mode, select the top and the bottom polygons, click on the box next to Inset to inset them with an amount of 0.5cm. Step 19: Press 2 on you keyboard to go to Edge selection mode. Make a ring selection like i've did below and click on the box next to Chamfer and chamfer the edges with an amount of 0.15cm and 6 Segments. Step 20: Now make a loop selection for the top and bottom edges like you see below. Chamfer them with an amount of 0.15cm and 6 Segments. Step 21: Unhide All. 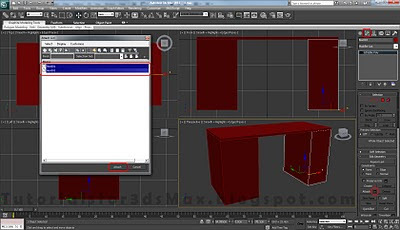 With the desk leg selected go in Element selection mode(shortcut key "5"), select the leg/element and with Select and Move tool holding down Shift copy the leg 7 times, select Clone to Element in the pop-up window. 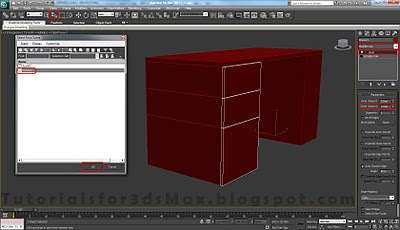 Step 22: In the next step of this 3d modeling tutorial go in front view and create a new box for the drawer handle. Length 2cm, Width 6cm and Height 0.5cm. Convert it to Editable Poly. Step 23: In Edge selection mode, select on edge and click on Ring to make a ring selection. 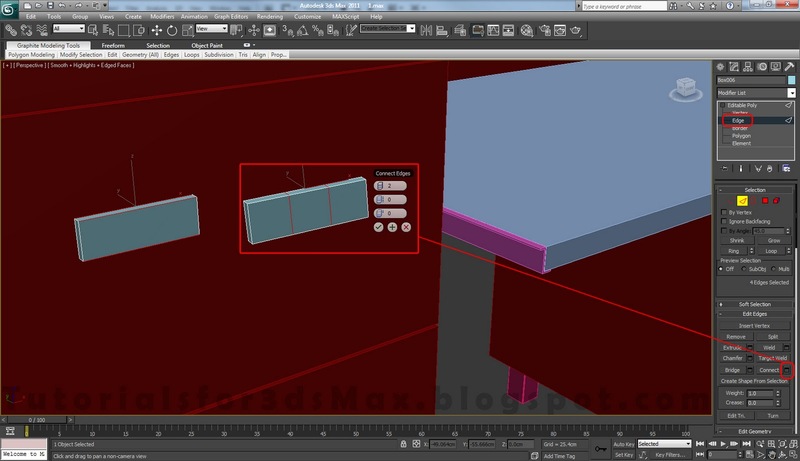 Connect the selected edges with 2 segments and 0 Pinch and/or Slide. 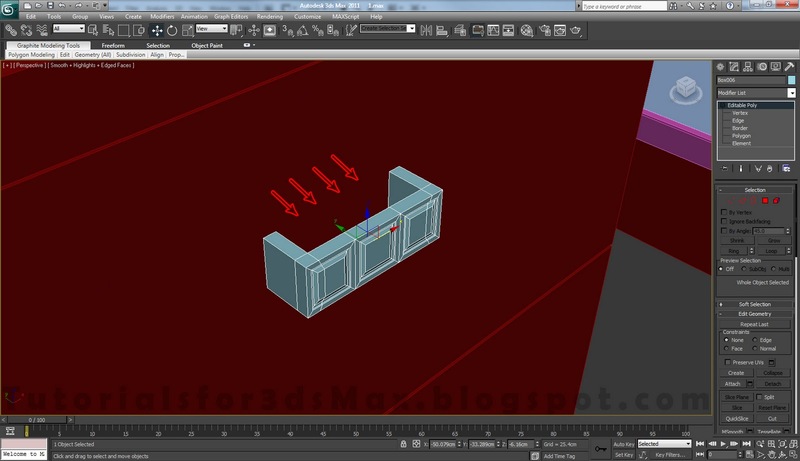 Step 24: Press 4 on your keyboard to go to Polygon selection mode and select the front 3 polygons. First Inset them with an amount of 0.2cm and Type by Polygon. Second Extrude them with an amount of -0.05cm and Type Group. 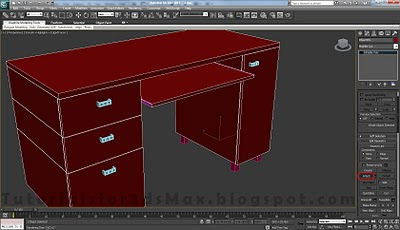 Third Inset them again with an amount 0.1cm and last Bevel the polygons with Height 0.05cm and Outline -0.15cm. 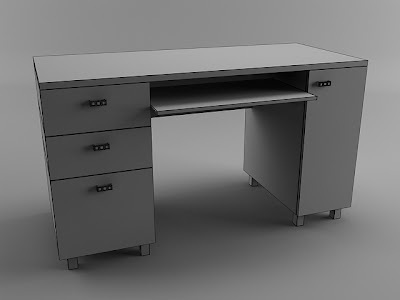 Step 25: With the drawer handle selected press 6 to exit selection mode. Press ALT+Q on your keyboard to go to Isolation Mode. 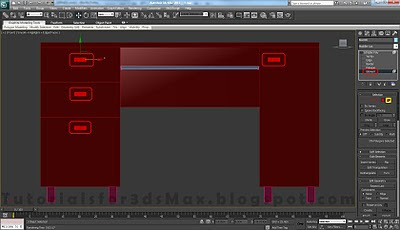 All other object disappear and a new window with "Exist Isolation mode" will appear. Leave it alone until you want to exit isolation mode. 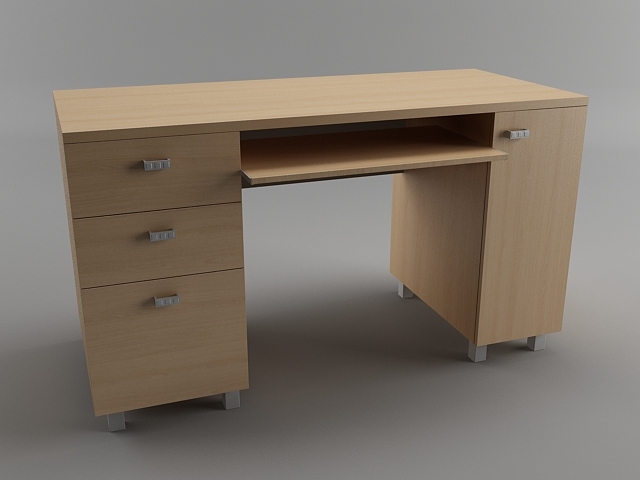 Turn you drawer handle around to see the back of it. 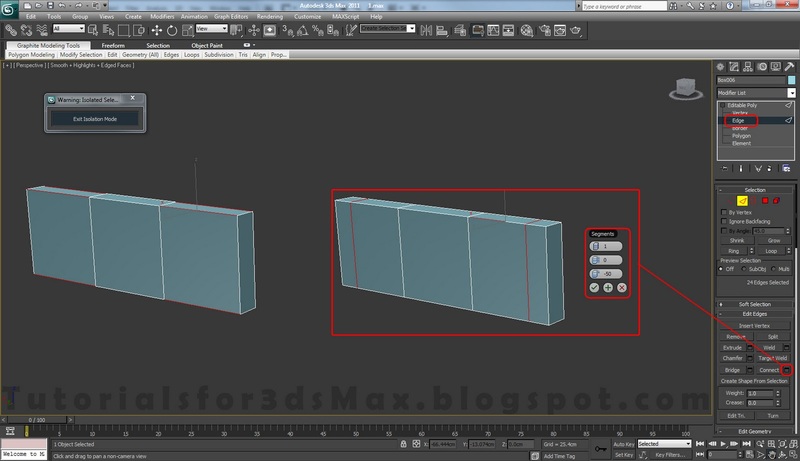 Make to Ring selection for the left and right edges. 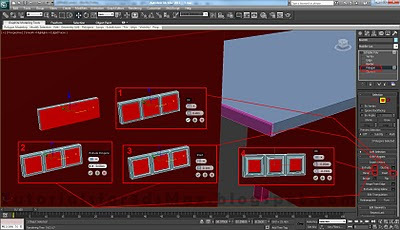 Select one from every part and press Ring.. Connect them with 1 segment and -50 Slide. 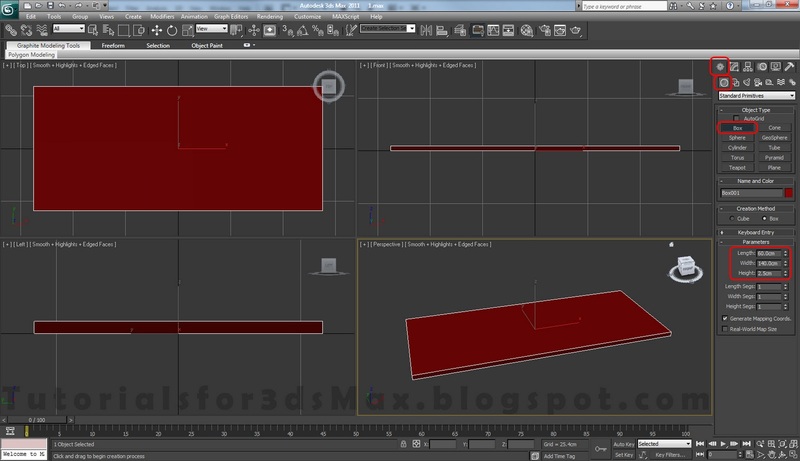 Step 26: Select the two new created polygons like i've did below and Extrude them with an amount of 1.5cm. 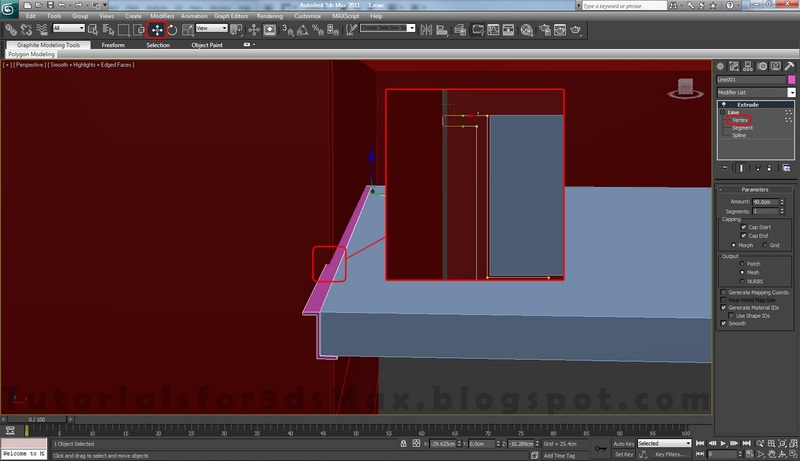 Step 27: Click on the window to Exit Isolation Mode. Move the drawer handle in front of the drawers to not overlap. Step 28: With the handle selected go to Element selection mode(shortcut key "5") and click on the handle to select it. Holding down shift copy it 3 time. 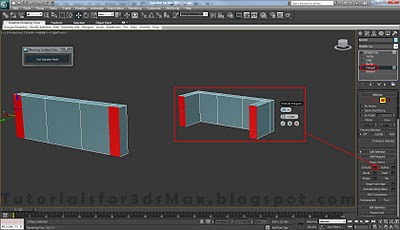 Select Clone to Element from pop-up window. Step 29: Attach all object together except for the Handles, Legs and Rails. 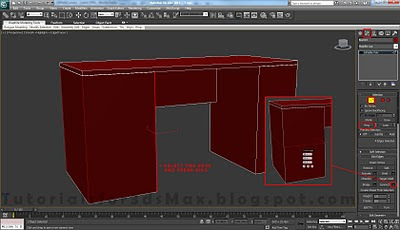 Step 30: With the desk selected go to Edge selection mode and press CTRL+A to select all edges. We are gonna chamfer all of our edges because in real world very few things have perfect edge corners, so click on the box next to Chamfer to chamfer the edges with an amount of 0.05cm and 1 segment. 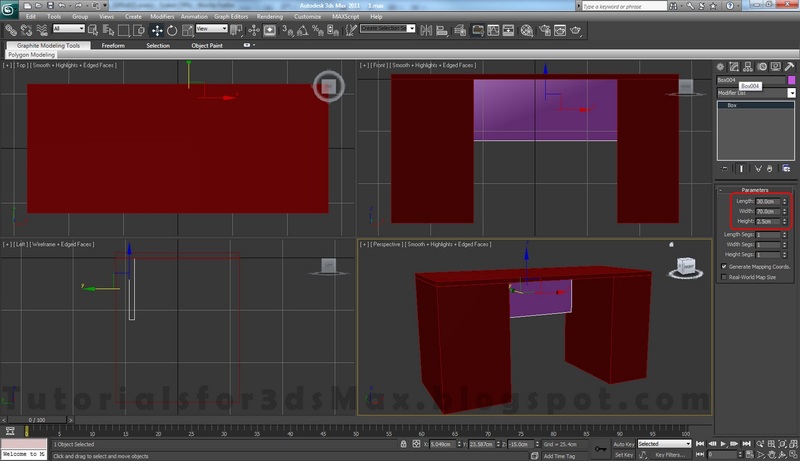 Step 31: For the final step of this 3d modeling tutorial we will change the objects color. Select them all. 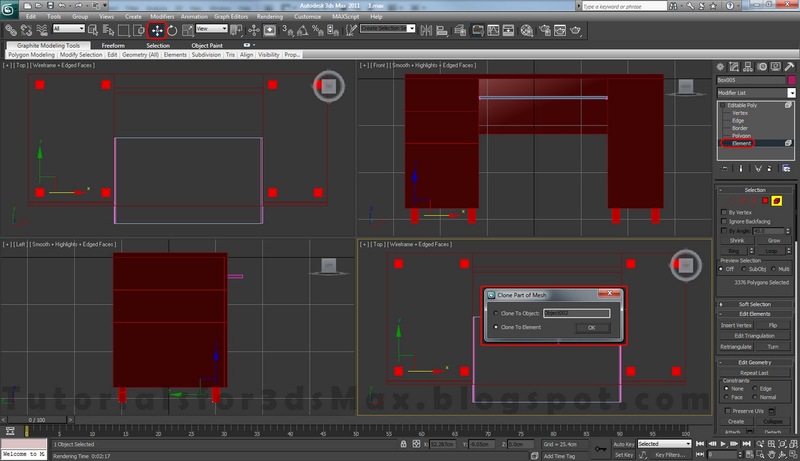 To do this we have 3 options: CTRL+A, click and drag over them or simple use Select from Scene(shortcut key "H"). 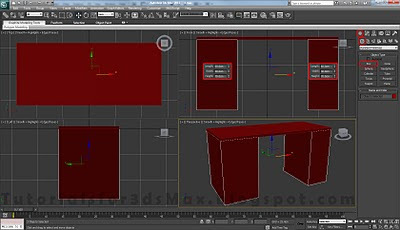 Next click on the little colored square in top right of the screen, chose your desired color and press OK. That's it, you've completed this 3d modeling example.